OGMA has been announced the prime Contractor in the Avionics Modification Program involving four Portuguese Air Force (PoAF) C-130 aircraft, which will consist of a nearly full replacement of the aircraft communication, navigation and flight control systems and instruments. Such modification will upgrade POAF C-130 aircraft to the latest CNS/ATM requirements (communications, navigation, surveillance/air traffic management). This program will be developed over two years, with the first aircraft starting modification work in 2019. OGMA will carry out the integration of all aircraft systems, manufacture the structural components and wire harnesses necessary for equipment installation, design the aircraft change and provide for project certification against the National Military Aviation Authority requirements and for project qualification according to POAF operational and logistic requirements. OGMA will also be responsible for updating the aircraft operating and maintenance technical data, providing operational training to flight crews and maintenance training to PoAF technicians. 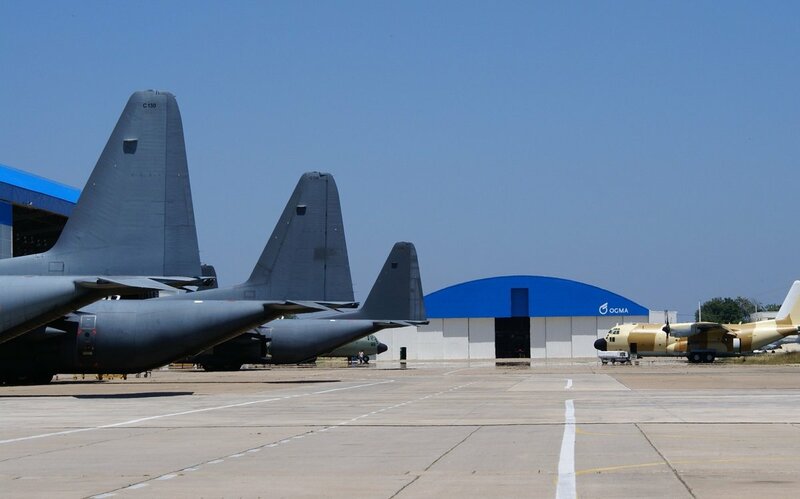 CEDAR RAPIDS (Feb. 27, 2019) - The Portuguese Air Force joins a growing list of customers that have selected Collins Aerospace for its C-130H Hercules military transport aircraft modernization effort. Serving as a contractor to OGMA – Industria Aeronautica de Portugal, Collins will provide its Flight2™ aftermarket avionics solution, which delivers the most cost-effective and lowest-risk CNS/ATM upgrade solution. Flight2 transforms a federated analog system into a modern digital glass cockpit that provides commonality to commercial aircraft. Included in the avionics upgrade is a full glass cockpit with new primary flight displays, Required Navigation Performance/Area Navigation flight management system with high altitude release point, and computed air release point precision airdrop software. As part of the upgrade, Collins will leverage its Flight2 Mobility Mission Application (MMA) architecture, which allows customers to select from a super set of off-the-shelf capabilities. Customers using the MMA architecture can tailor the system to meet specific mission requirements, comply with regional communications navigation surveillance/air traffic management mandates, or simply to maximize capabilities for a given budget. By upgrading to Flight2, the Portuguese Air Force’s C-130H will be in in compliance with the most recent International Civil Aviation Organization standards, while also equipping it with a tactical advantage in military operations.